Right place to get the solution. If you are facing a problem, you might be thinking from where to get it fixed. So Innofreak is the right place to get the solution. Innofreak is a growing company to provide solution and maintenance in the various areas of Information Technology from last 2 years with its office currently in Ranchi and service support at across Bihar and Jharkhand covering locations like Patna, Muzafferpur, Gaya, Jamshedpur, Ranchi, Dhanbad, Bokaro etc. It extends maintenance on all latest platforms and offers solutions and turnkey project in structured networking, LAN ( Local Area Network ), WAN ( Wireless Area Network ) connectivity, SAN-NAS data security and storage, Server and High Computing Solutions. Surveillance, Firewalling, Cyber Security are our few technical strengths. Innofreak Service team has qualified personal from all areas of technologies & has experience in almost all the operating systems viz. Windows Vista, Windows 8, Win Advance Server, RED HAT Linux, SQL Server, SAP and many more. New computer equipment is usually sold with a warranty. The warranty typically lasts one year, but some vendors offer multiyear warranties. If the computer fails while it is under warranty, the vendor should resolve the hardware problems at no additional cost. We also offer low cost third party maintenance services, annual maintenance contracts (AMC) for Laptop and Desktop. If your computer is out of warranty and you are facing a problem, you might be thinking from where to get it fixed. So Innofreak is the right place to get the solution. Test & Repair Services: Many people have similar computer troubles. Want a DVD drive or CD burner? Well, there's no need to fret Innofreak can take care of all your needs! We also custom build computers to your specifications, or tell us what tasks you want to perform and we will build a system to do the job! 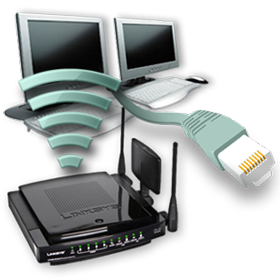 Innofreak is a wireless solutions provider offers complete wireless technology with installation and maintenance. Innofreak has well experianced d-link and Cisco installers for Structured Cabling Systems. Innofreak installs, terminates, tests, and/or maintains Fiber Optic Cabling, Backbone Cabling, Cat 5 & Cat 6 Cabling, Riser Cabling, Horizontal Cabling for Voice and Data Systems. We provide site survey that includes evaluation of new or existing facilities, identification, testing and documentation of existing cable runs. We provide integrated Data, Voice and Video System Design. Be it a CAT 5 or a CAT 6 or a state-of-the-art optical fiber installation, we know the standard and we deliver quality installation. Virtual Private Network (VPN) is a Closed User Group created for providing backbone connectivity between locations over a Wide Area Network (WAN). VPN replaces the PtP intercity links running between customer locations with a last mile connection (wired/wireless) to the nearest Service Provider's Point of Presence. The backbone between POPs provides a highly redundant, reliable, commercially attractive solution. VPN allows a private intranet configuration to be securely extended across the Internet or other network service, facilitating secure e-commerce and extranet connections with business partners, suppliers and customers.